The GMAS completed another successful CBC on Sunday, December 17, 2017 under the able leadership of Shirley Johnson. This was Shirley's twentieth year organizing this event-a record in itself-and the 70th CBC conducted in the Burlington circle. We were not disappointed. The weather was acceptable by CBC standards and birds were plentiful, though somewhat lower than recent years. We counted 17,516 birds (the 2014 record was 24,306) and recorded 70 species. During count week three additional species were added to our count-Snowy Owl, Northern Mockingbird, and Red-winged Blackbird. Woodpeckers were especially common this year. 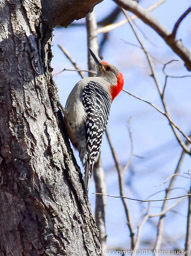 Twenty-eight Red-bellied Woodpeckers were counted, more than double our previous record. Also, ten Northern Flickers represented a new record for our count. Likewise, 835 Dark-eyed Juncos and 26 White-throated Sparrows smashed previous records for our circle. Individual observations of note included a Golden Eagle seen at Macrae Park, a Yellow-bellied Sapsucker present at a feeder, and two Turkey Vultures, an unusual species at this time of year. On the downside, there were no irruptive species reported in our count this year. In general, the number of duck and goose species recorded was lower than usual, possibly due to mild weather preceding the count. In fact, there were no Wood Ducks, Northern Pintails, or American Wigeon reported this year and significantly lower numbers of Snow Geese, Canada Geese, Mallards, Black Ducks, and Common and Hooded Mergansers were counted. Only Greater and Lesser Scaup and Common Goldeneyes were frequent, though well below record-breaking numbers. Among the songbirds Black-capped Chickadees, while common (642) were far from our record set in 2006 of 1072, an observation in keeping with state-wide findings in the VT eBird database. Likewise, Red-breasted Nuthatch numbers were very low (14), especially when compared to our record of 95 set in 1997. This year we had 14 teams plus feeder and Crow counters consisting of 63 participants. Fifty years ago in 1967 only 6 observers participated in the CBC. In 1967 this small group reported 3528 birds and 42 species. We have grown over the years, but the enthusiasm for birds never wanes. Already we are looking forward to the 71st Burlington circle CBC in 2018. Hope to see you there.